Officials in eastern Afghanistan say a suicide bomber has killed at least 13 people and wounded 14. 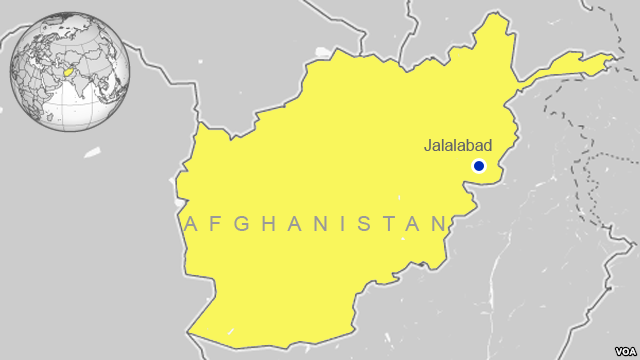 A spokesman for the Nangarhar provincial government said the bomber detonated his device Sunday morning in Jalalabad at the residential compound of Obaiduallah Shinwari, a prominent member of Nangarhar’s provincial council. Shinwari escaped unharmed. Local media say the explosion happened during a gathering of tribal elders who had gone to the residence to welcome home Shinwari’s brother, Saminullah, who had been held by the Taliban for nine months. Reports say Shinwari’s father, Malek Osman, was wounded in the explosion. The U.N. Assistance Mission in Afghanistan condemned the assault. “UNAMA reiterates that civilians may never be deliberately targeted in any location. Such attacks are explicitly prohibited under international humanitarian law. The mission reminds all parties to the armed conflict in Afghanistan that they are bound to uphold their legal obligations to at all times to avoid harm to civilians,” a U.N. statement said. Shinwari’s compound is in the same city where a gun and bomb attack near the Pakistani consulate Wednesday killed seven people. Islamic State militants claimed responsibility for that blast.